You're spoilt for choice if you're in the market for a sleek, bezel-free, Android-based smartphone with a 6-inch or larger screen - because in recent weeks both the Samsung Galaxy Note 8 and the LG V30 have been announced, and they're both very appealing. But how do they match up against each other? Should you be giving your money to Samsung or LG in the run-up to Christmas? 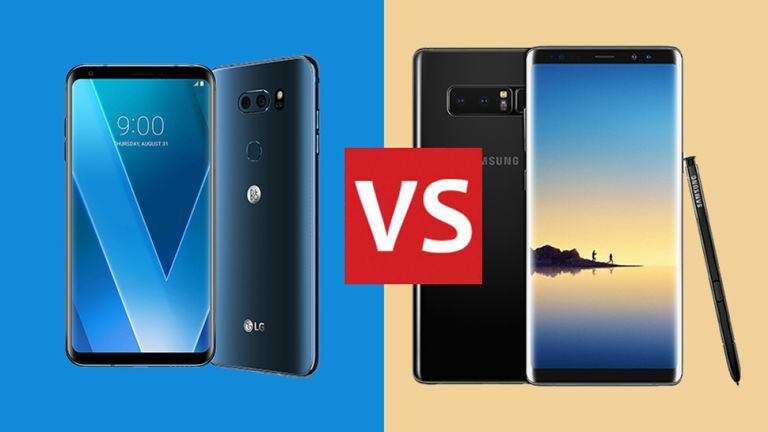 We've put these two handsets head-to-head in all the categories that matter, so you can make the most informed choice possible. Well these are two fine-looking smartphones: both have curved looks, gorgeous screens, minimal bezels, and an 18:9 aspect ratio for the display (though the one on the Note 8 is technically 18.5:9). Speaking of screens, the LG V30 (above) has a screen size of 6 inches, with a resolution of 1440 x 2880 pixels - that's a pixel density of around 537 pixels-per-inch. The Note 8, on the other hand, offers a screen size of 6.3 inches and a resolution of 1440 x 2960 pixels (521 ppi). You get more pixels with Samsung, and slightly more sharpness with LG, but in actual usage you're not really going to notice the difference. Otherwise both phones are very similar, down to the rear fingerprint sensor and dual-lens cameras: it's really a question of taste as to which you prefer. You can pick up the LG V30 in black, silver, blue or violet, and the Note 8 in black, gold, grey, blue or pink, depending on where in the world you live. Both phones use the flagship favourite, the Snapdragon 835, as their CPU of choice - in some regions the Note 8 (above) has Samsung's own Exynos 8895 fitted, but in performance terms they're comparable. The LG V30 has 4GB of RAM, and the Note 8 ups that to 6GB. You might get slightly better performance on the Note 8 then, but not by a huge margin (both use the same Adreno 540 graphics processor inside), and software optimisations always play a part too. Neither phone is ready for Android Oreo yet, and they both make do with Android 7.1 Nougat. As for on-board storage, the LG V30 sticks with 64GB, unless you go for the slightly more expensive 128GB LG V30+ instead. The Note 8 is available with 64GB, 128GB or 256GB attached, if you're willing to pay for it. Both phones can take microSD cards, so you can expand on that if you need to. Both phones take the dual-lens camera route here: two 12-megapixel lens for the Note 8 and a 16-megapixel and a 13-megapixel lens for the LG V30 (above). The front-facing cameras are 5-megapixel (LG) and 8-megapixel (Samsung). Camera quality is about more than megapixels of course, and the LG V30 sets a new smartphone record with an F1.6 aperture on its 16MP lens - that means it lets in more light than any phone camera that's come before it. Without having tested these phones fully we can't speak to the quality of their photos, but given their heritage we're expecting them to both offer some excellent results in all kinds of lighting conditions. As for battery, both these phones have a 3,300mAh battery fitted, so it's really up to the Samsung and LG engineers as to which will get you the furthest through the day without a recharge. Stay tuned for our full reviews to see which wins out. Both these phones have their extras and their quirks which are worth considering. The Note 8 of course comes with the usual S-Pen stylus (above), unlocking various features like instant translation of web pages and the option to scribble down notes if you need to. The LG V30, meanwhile, boasts a 32-bit Hi-Fi Quad DAC for the audiophiles out there and comes with some Bang & Olufsen headphones in the box. It's perhaps worth considering for movie makers too, as it comes with focus zoom and cinema-style overlays to help your video clips look more professional. Then there are the assistants to consider: the Note 8 sticks with Samsung's Bixby as the go-to helper app, while the LG V30 has Google Assistant instead, checking your schedule, answering questions, and so on. The LG V30 and the Samsung Note 8 have only just officially appeared, so it's early days to be making definitive judgements, but from our first impressions it's hard to separate these phones in terms of style and specs. If you're happy with LG phones then you're probably going to want to stick with LG and vice versa - these are very impressive handsets but there's not enough daylight between them to really make you consider jumping ship from one manufacturer to another, unless you really need a stylus or Google Assistant. A lot could depend on price. We don't have details for the LG V30 yet, though it's rumoured to be around the £700 or $700 mark - that would make it significantly less than the £869 or $930 you'll pay for an unlocked Note 8, and that could tip the balance. How does the 2018 Note match up to the 2017 Note?